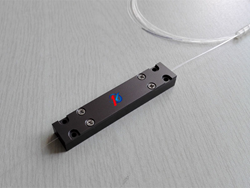 Recently, DK Photonics has announced that its pump combiner, which is adopted in the high power fiber laser area, has already been in mass production and supplied for many famous clients of this industry. Recently, DK Photonics has announced that its pump combiner, which is adopted in the high power fiber laser area, has already been in mass production and supplied for many famous clients of this industry. Featured by stable product performance, competitive price and quality service, the business has won sound reputation from the clients. Besides, its PM type pump combiner is also available for mass production. DK Photonics announces that they can produce pump combiners including 2X1, 3x1, 7x1, 19x1 pump combiner; and pump and signal combiner (2+1) x1, (6+1) x1, (18+1) x1 and so on. Pump fiber, signal fiber and output fiber type and the configuration can be customized. “If you do not see a pump and signal combiner from the standard configuration that meets your needs, you have the opportunity to provide your desired specification and we can quote a custom pump and signal combiner. Requests for custom pump fiber, signal fiber, output fiber type and the configuration, the handling power or other specific needs will be readily addressed. DK Photonics can respond to custom requirements with a short lead time.” The spokesman for the company says. Pump Combiner is designed for high power laser applications. It can be used to combine the power from several multimode laser diodes, delivering the combined power for applications in industrial, military, medical and telecommunications markets. DK Photonics boasts more than hundreds of types of various combiner configurations, such as 2x1~19x1, (2+1) x1, (6+1) x1, PM (2+1) x1, PM (6+1) x1, etc. DK Photonics currently has four fiber conic machines that can produce pump combiners; they use their experience to improve the production process of pump combiners. They can produce some special pump combiners. Beside the combiners, mode field adapter (MFA) and cladding power stripper (CPS) they also can provide. DK Photonics is an optical-communication company under great development. The technical team is led by experienced professionals who have worked in the famous company of optical-communication for years. DK Photonics boasts a highly structured system for quality control as well as efficient management for production. Meanwhile, it is building a sale and marketing team with active, efficient, enthusiastic and professional characteristics, so as to provide its clients with better support and service. After years of development, DK Photonics has accumulated numerous clients at home and abroad. Its business mainly comes from the United States, Europe, Japan and Korea. The stability of product quality is critical to the optical communication enterprise. The sound quality of a product requires not only a superior management system, but stability of the personnel. DK Photonics not only has systematic training and humanized management, but provides the employees with free dormitory and meals, monthly articles for daily use. In this way, with attractive benefits for employees, the low employee turnover rate has played an active role in high-efficient production and stability of product quality.